I would like to suggest a collaboration project between all modders who wish to participate, in the form of a Diehard Wolfers ECWolf pack. This pack would contain new enemies, weapons, and entities, and if enough interest is accumulated, maybe levels. Input is welcome, and I hope that at least a few people are interested. Even if someone has unused graphics kicking around, that would be helpful. I have a rocket launcher if you need it. I used it for my mod, hope it's not a problem. This is a very small community, it doesn't have the same amount of members like Doom's so big projects can't just be started up around here on the flip of a switch, unfortunately. I would contribute to mapping for such a project but I've yet to finish or release my vanilla episode 1 replacement (should probably get on that, only 3 floors left) and I'm still a newb at Wolf mapping even if I like to think I'm pretty decent. I wasn't asking for anyone to jump right in, I just hoped someone would at least state their disinterest. Wolf3DGuy: Sounds nice! I have no problems with the use of someting elsewhere; it's your resource. I can send it in PM? What do you think of "directional tables"? on the 4 edges of a tile, so that the table is "3D", and is only one map tile wide. This can be done in ECWolf, and I know it's never been done in SDL/DOS. It can be done fairly easily in SDL/DOS, but I personally feel like it's a bit of a cheap effect (the table top being at the player's head height is pretty strange too). It is a cheap effect, but I at least enjoy the fact that it looks a bit more 3D. Yup. A bit strange, but looks nice. What's up with the flares? Animated flares? Yeah, the candles are animated. You can't see them too well against the grey, but they're there. You could also use this techique for something like small crates (and they would make more sense to not be below head level). And if you combined directional objects on edges (like walls) with directional objects in the middle (like doors), you could even make 3d objects that are only 32 pixels in size (at least visually). Now that would be neat! The crates are a good idea (I actually considered them before I read this comment), as is the idea of creating objects that are 3d with directional sprites. 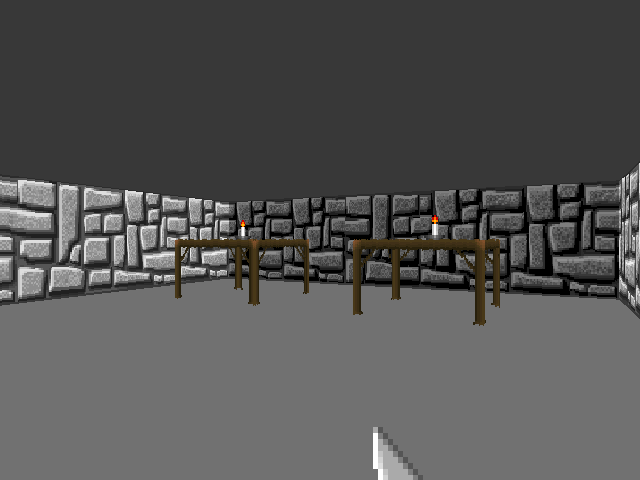 Columns could be made actually round, walls could be diagonal, door could be animated like in ROTT (But they'd have to be automatic), and MUCH, MUCH more. Truth be told, I think the table would be better for one of Schabbs' projects, maybe with a mutant on it or something. Schabbs is huge, after all. Precisely! Like the The DieHard Wolfers' TC, but ECWolf. New maps would be ideal, but "a few" contributors are needed before we can make this a large TC like project. Well, I, for one, am always ready to make some maps! Before we make maps though, we would first have to make the map symbols. I have some ideas for automatically-opening doors and other effects that would have to be made into map symbols., but this shouldn't take too much time. Doors that open when you're near them? Tables with items on them with a radius of 33 so that when you walk against the tables you pick the items up? Crates that can be destroyed to yield a random item? Half-tile wide walls that are 36x64, like shelves? Maybe this could be one of the bosses? It could be recurring, or be a defence to a fortress. If I can find it, I have something like this that I already started. I was going to use it as a template for vanilla wolf themed ecwolf packs, but the time I have had for modding is zero lol. When I get off of work tonight, I'll upload it and see if you guys can work with it. I encourage this project to use any assets from my projects (except maps) that might be appropriate. Just make sure you read the credits and acknowledge the original sources. Why not the maps ? Does this need to be ECWolf only? Does ECWolf assume a specific format here or can the same data work in another engine? ECWolf uses .wl6 ( Or sod, wl1, sd2, sd3, or sod) data to create a base resource, like you would have in a DOOM mod. Then, files ( pk3, pak, zip, wad, etc ) are opened with ECWolf that contain the data of the mod. For example, If you wanted to replace the guard sprites, you'd place all your new frames, in DOOM spriiting convention ( GARDA1, GARDA2, etc), in the sprites folder of a .pk3 file, or in-between the ss_start and ss_end markers. ECWolf is essentially ZDoom for Wolfenstein, with decorate code, DOOM Sprite formats ( .lmp, .png, .tga ), and the convenience of being able to make a mod that doesn't give half the graphics away for free.